Posted on September 20, 2017	by Blowhard, Esq. Butterfield, a Christian Tory, is reacting against those 19th and early 20th century historians who see Luther and the Protestant Reformation as ushering in the modern era of religious liberty. In the Whig interpretation, the modern world is the result of the progressive Luther triumphing over the reactionary Catholic Church. Butterfield argues that it’s more accurate to say that the modern world is a the result of the interactions between Luther and the Catholic Church. “The case against the whig historian lies in the fact that he brings the effort of understanding to a halt. He stops the work of imaginative sympathy at a point that could almost be fixed by a formula. It would not be untrue to say that, apart from specialist work of recent date, much greater ingenuity and a much higher imaginative endeavor have been brought into play upon whigs, progressives and even revolutionaries of the past, than have been exercised upon the elucidation of tories and conservatives and reactionaries. The whig historian withdraws the effort in the case of the men who are most in need of it.” Maybe the whig historian doesn’t really intend to be a historian at all. This entry was posted in Books Publishing and Writing, History and tagged Herbert Butterfield, the right side of history, the wrong side of history, Whig history, Whigs. Bookmark the permalink. History has no telos unless we give it one. Isn’t that the whole point? New Republic writer thinks Ken Burns Vietnam War documentary tries too hard to unify us, and provides too many perspectives, and that this is an “insidious” tool of obfuscation. “Yet despite these admonitions against present-minded, progressive historiography, Butterfield himself was at least intermittently a Whig historian, and it may be best to view him as a chastened member of this school who recognized its limitations but couldn’t escape its grasp. In The Englishman and His History, published in 1943, Butterfield rehabilitated one side of the Whig tradition, the search for—and to some extent invention of—an “ancient law” in which the “historic liberties” of the English people were thought to be grounded. 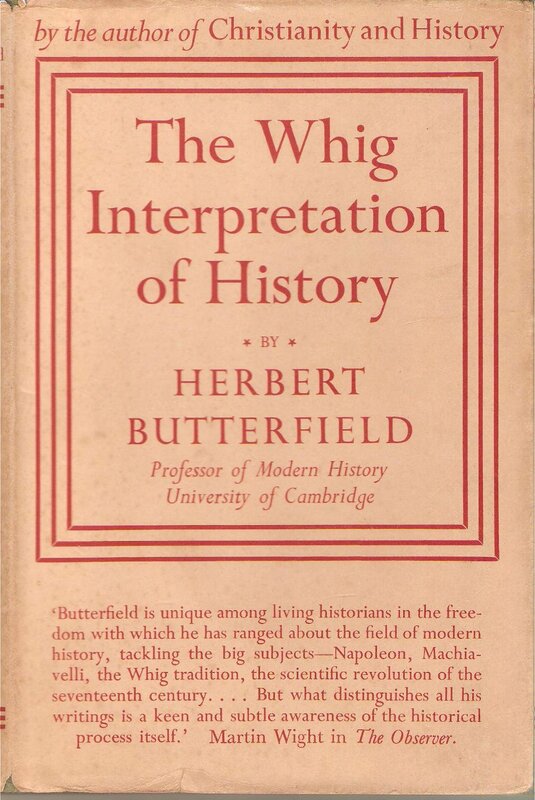 Even in The Whig Interpretation of History, Butterfield praised the achievements of Whig history for showing “that prejudice and passion can make a contribution to historical understanding. Who would believe these sentiments came from someone who seeks to remove “value judgments” from the study of history? And what do we do with an oft-quoted aphorism from Butterfield’s 1952 work Christian Diplomacy and War, where we discover this moral claim: “the great menace to our civilization is the conflict between giant organized forms of self-righteousness.” We may want to yell “right on” upon encountering such a fine judgment, but Butterfield is once again violating his own advice.